What is a Biennial? Part II – Where do we go? The story I have given you so far is largely a European one. That same old story in which history was being made in the Euro-American West all along, while we (the rest of the world) only surfaced from the darkness somewhere in the mid twentieth century, after the West had finally taught us enough to permit our emergence as newly minted modern subjects. Not quite developed, but nonetheless “developing”. This, in addition to the spectre of the Crystal Palace, could have been the intellectual death knell of the Biennial as the preeminent exhibition format. Yet, the biennial has thrived on precisely this contention, and the resistance to it. In fact, the genre is in many ways defined by a grappling with the well-founded charge of Eurocentrism levelled against the global art establishment. In considering a “Biennialogy” Filipovic, Van Hal and Øvstebø also consider the Crystal Palace/counter-museum narrative of Biennial genealogy but then ask: “…how much of what biennials have become, in the aspirations of many of them to represent cultures other than those of the West and to reflect a truly international art world, is the result of an entirely different kind of genealogy?” They recall the problematic, but ground-breaking in its time, Les Magiciens de la Terre (1989.) That exhibition sought to address what curator Jean-Hubert Martin reportedly referenced as “one hundred percent of exhibitions ignoring 80 percent of the earth.” The exhibition sought to revise the traditional Paris Biennial format by exhibiting 50 Euro-American (i.e. Western) artists shoulder to shoulder with 50 non-Western artists. Whatever we might think of the exhibition now, it changed the face of the biennial form, sparked many debates and broadened the horizon of what an international art world might mean. the existing tensions between tradition and contemporariness, the challenge to the historical colonization processes, relations between art and society, the individual and his/her memory, human communication in the face of technological development and the dynamics of urban culture … without distinction among the multiple forms of visuality that operate in culture as a system. Now that looks familiar. It turns out the history of the Biennial is also made in our image. This is saying nothing of the São Paulo Bienal (second only to Venice, with its first staging in 1951) or the Gwangju Biennale (1995) both of which had significant impact and did much to shift the contemporary art establishment away from its Eurocentric beginnings. Haiti’s Ghetto Biennale, in which Jamaican artist Ebony G Patterson has participated (2009), is another interesting iteration and interruption of the biennial model. 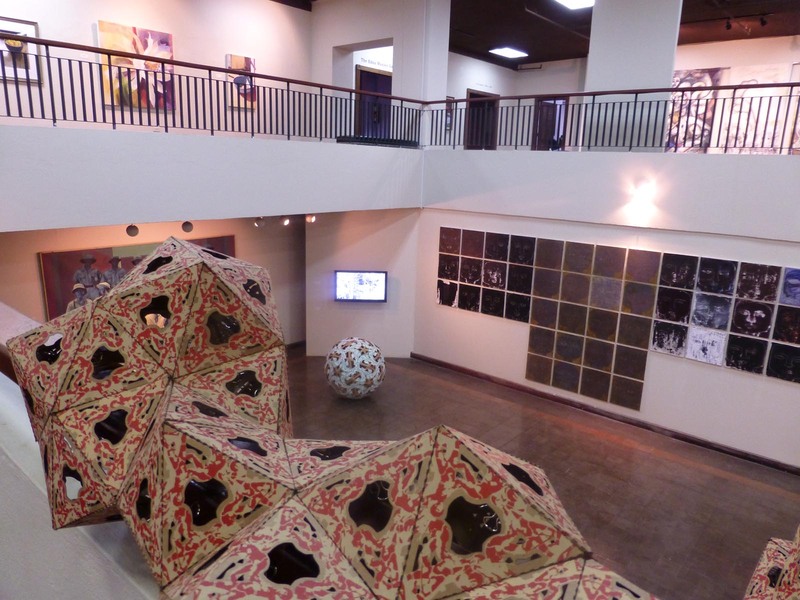 The exhibition is hosted by Atis-Rezistans, a collective of artists that work and live in the Grand Rue area of downtown Port-Au-Prince, Haiti. Designed with the Haitian context in mind, the Ghetto Biennale invites international artists to come to Port-Au-Prince, stay for one to three weeks, and produce work in collaboration with local artists. The work is then exhibited where it was made, within context, in Grand Rue. The intention is to invite opportunities for greater exposure and exchange for Haiti’s prolific but often isolated artists, but also to invite genuine engagement from foreign artists and visitors with Haitian life and culture. An engagement that will undermine, or at the very least complicate, the problematic portrayal of Haiti in the global media as a poverty-stricken, disease-riddled abyss. The exhibition also has discursive bite, asking: “What happens when First World art rubs up against Third World art? Does it bleed?” The 3rd Ghetto Biennale in late 2013 invited “artistic projects, which investigate or respond to ‘The Market’ from the local to the Global.” The exhibition was also declared a lens free event, i.e. no cameras, “to partially resist both the ethnographic gaze and the commodity fetishism that the lens can engender.” Did I mention that it’s a form that is constantly interrogating itself? The biennial’s essential multiplicity – its attempt to make order of disparate parts, while self-consciously interrogating its own will to order- united only by its components’ concurrent-ness seems to me an excellent analogue of the rapidly morphing face of international politics and cultural identity that has come to define the 21st century. Get your multiple modernities here! …the proliferation of biennials in the past thirty years… has occurred ‘completely in tune’ with the global integration of markets and the worldwide dissemination of information about localities everywhere, along with the resistance to such globalising forces. The tension between the homogenizing and anti-homogenizing forces of globalization itself is captured in the biennial, with its simultaneous foregrounding of both international and local art and its highlighting of the complex relays between them. At this point, we may turn again to our own 2014 Jamaica Biennial, which shows all the signs of stirring up these same debates. With “Brand Jamaica” dwelling alongside long-standing and sometimes problematic appeals to anti-imperialist rhetoric (no one needs to be reminded of “not in my cabinet”) there has never been a better time to explore the concept of Jamaican-ness and its relationship to the region and world. As communication technologies have us connected more than ever before, and sprawling Diasporas restructure our national identity, borders are shifting in ways we haven’t yet grasped. The Biennial format, for all its complicated histories, offers a space to participate in a working out of this complex and charged “right now”. The NGJ as an institution has responded to the new demands; opening the Biennial to the Jamaican diaspora in 2012, exhibiting international artists for the first time in 2014, and developing plans to invite more participation from the broader Caribbean in future. Much like the biennials across the globe, the Jamaica Biennial has positioned itself to offer exposure for local artists, and exposure to movements in regional and global art (via the diaspora and the invited Caribbean artists). The biennial model’s relationship to city renewal and establishment of cultural capital (and capitals), has not escaped the NGJ’s attention. Hopefully, it will not escape that of the Jamaican government. As plans for the renewal of downtown continue to unfurl, the Jamaica Biennial is poised to play a significant part in bringing people (locals and internationals) back to Downtown Kingston. For my part, I can’t say I’m completely clear on what a Biennial is, or should be. As with the rest of contemporary experience, the status of the Biennial is in flux. I do, however, see some interesting opportunities emerging that give some sense of all it could be. I haven’t found a definitive citation of this quote, but several sources reproduce it. See Dodd, Philip. “Content is nothing without context.” FT.com. Financial Times, 8 Jan. 2014. Web. 13 Nov 2014. 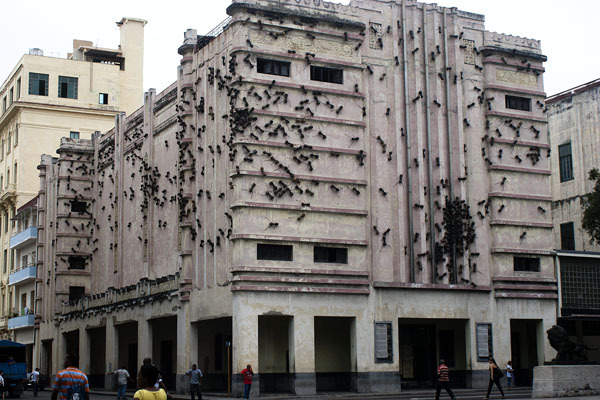 “The Havana Biennal.” BiennialFoundation.org. The Biennial Foundation. Web. 12 Nov 2014. “The 3rd Ghetto Biennale, 2013: Decentering the Market and other Tales of Progress.” Ghettobiennale.com. Atis Rezistans. Web. 18 Nov 2014.